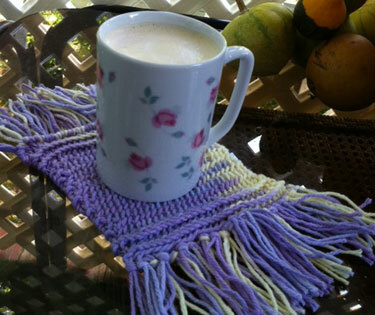 Sunday Afternoon Dish Cloth - Get the pattern below! 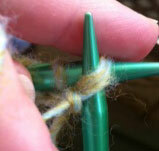 Experienced knitters may not think much about how to do a simple project, like a dish or wash cloth. New knitters, however, probably don't know where to start. I know I didn't. 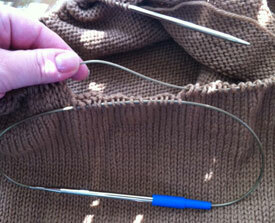 So, if you are a new knitter, here is a tutorial for you. If you aren't a new knitter, then here is a quick and easy project if you need a little instant gratification. There are really no rules for knitting a dish or wash cloth - you can use whatever stitch pattern you like, any size needles, make it big or small, it's all up to you. You don't even need to make a gauge swatch or block the finished cloth. 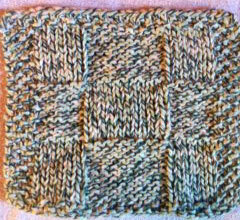 I like to make dish cloths to get familiar with new stitch patterns, or just make it up as I go. There are many yarns to choose from: Lily Sugar and Cream, Lion Brand Cotton Ease, Bernat Cotton Tots, Lion Brand Baby's First, Patons Grace to name a few. If you are just going to be using your cloth to do dishes, I recommend using a cheaper cotton such as the Sugar and Cream. You can use the same for a wash cloth, of course, but if you'd like to pamper yourself then use perhaps the Patons Grace or another nicer cotton yarn. I usually use the needle size called for on the ball band; if you would like a denser, tighter fabric then try a smaller needle, and a larger needle if you'd like a less dense fabric. Of course, you can always do a small swatch in the yarn you like with different needle sizes to see what results each gives you. Now, pick a stitch pattern. There are many to be found on the web, or if you happen to have stitch pattern books, grab a cup of tea ( or something stronger ), sit back, and spend time looking through them. Maybe there is a stitch you like but have been afraid to try - now is the perfect time to give it a whirl! Since cloths are so small, there won't be much wasted time if you end up not liking it and can easily frog it and try something else. 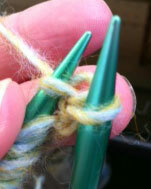 Once you have your stitch pattern, you are ready to cast on. Use any cast on you like. I like to add borders on my cloths - you do not need one, but if you are going to do a stocking stitch fabric, a border will keep the edges from curling. 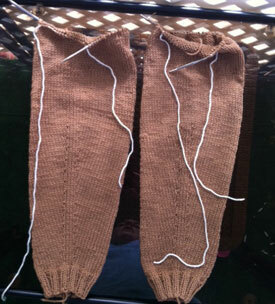 I usually like to knit the first 2-4 rows in seed stitch, and then keep a 4 stitch border on each side in seed stitch. 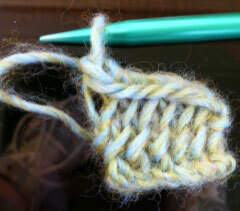 A simple garter stitch border will also do nicely. 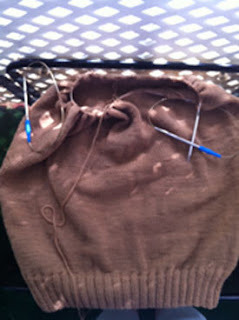 Depending on which yarn and needle size you choose, the number of stitches cast on will vary. In the Sugar and Cream yarn, 40-45 stitches gives me a large sized cloth; 30-35 makes a cloth that is a bit smaller and is just a tad bigger than my hand and feels most comfortable to me. I cast on depending on what mood I am in that day. When the cloth is as long as you want it to be, bind off. 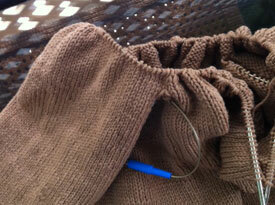 If you have added a border, knit as many rows on the top as you did along the bottom edge and then bind off. 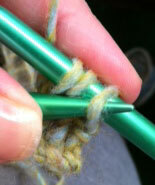 You can use any bind off you like, and then weave in the ends. 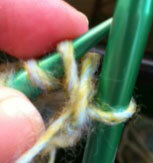 You can also make a loop to hang the cloth if you wish. Just cut an extra long tail, about 6 inches or so (better to have too much than not enough), and then single crochet to the end of the tail and attach it to the corner of the cloth. Now go use and enjoy your new cloth! And here is the video tutorial on how to knit a dish or wash cloth. Enjoy! I can't believe I forgot to post about this this year! I was in Michaels this morning, and saw the Bernat set up with their pink yarn and patterns, and it reminded me. Go to the Bernat website for their patterns and yarns for breast cancer awareness knitting. Lots of nice stuff. Hi knitters! Here is info on what I talked about in this episode. You can find links to all of the magazines I show in the 'Magazines' tab at the top of the blog. I did not have Knit Simple or Knit n Style on hand, but those issues are also currently available right now. Cozy Winter Knits - Special issue from Knitting Today! And, the beautiful yarn, Silky Merino by Malabrigo, which I got from Jimmy Beans Wool. Love this yarn, and can't wait to make my vest! 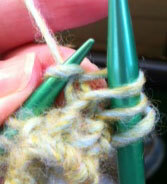 That's going to wrap it up for now, or should I say, this is the Bind Off! Until next time, Happy Knitting! Hi all! I am in the process of adding fringe to a little project I've been working on, and thought I'd share how to do it, incase you have never played around with fringe before. Here is the video. Enjoy!